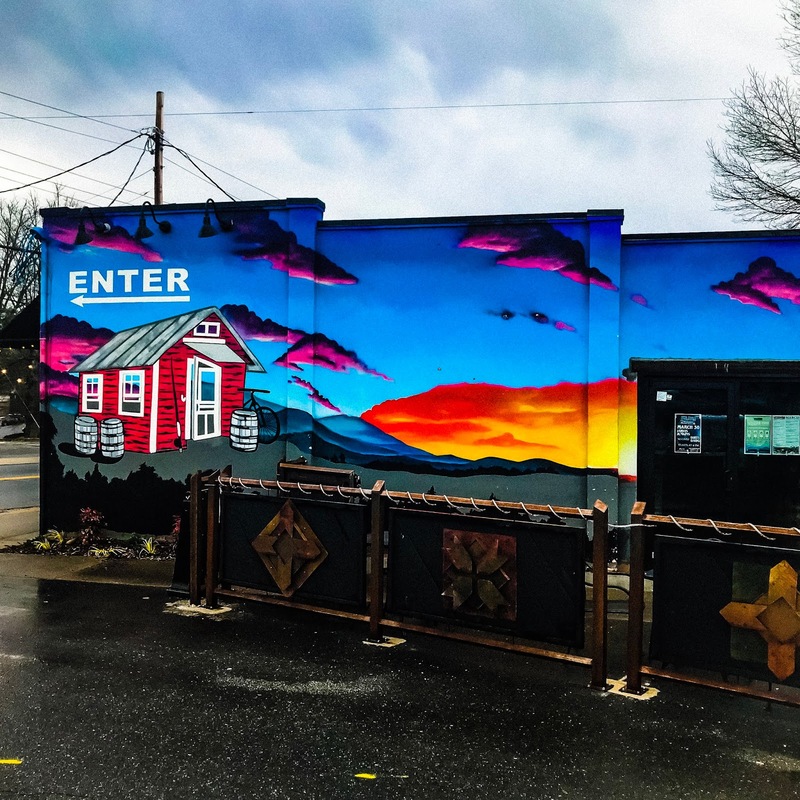 Up Country Brewing is a restaurant and tap room off Haywood Road in West Asheville. 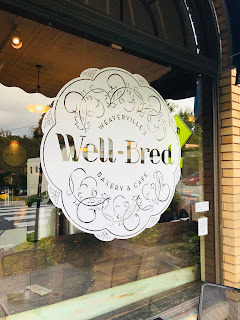 I had been eyeing their vegan “Impossible Burger” for quite some time; as impossible burgers are pretty hard to come by in WNC. 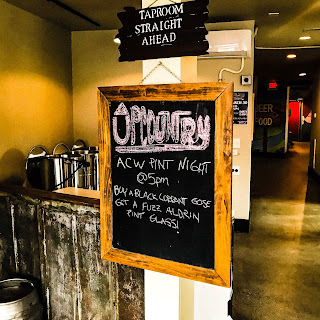 When I found out that the Asheville Cat Weirdos were holding a fundraiser every Thursday evening in March to support their emergency fund - I knew it was the perfect time to stop by and check out the brewpub. Each week Up Country will have a different pint glass available to take home for a small $5 donation. Of course; if you *can* donate more - you totally should. The proceeds not only help out cats; but your own neighborhoods cats. Totally legit - and amazing. I had initially had the intent to go the week that ‘Lars The Purrissan’ had his glass featured - because I’m a huge fan of his IG page, but came down with the sniffles - so actually went the week of the ‘Fuzz Aldren’ glass... also a *total* cutie. Bonus; I got to meet Fuzz Aldrens’ human and she showed me the pic of him that the glass was molded after. 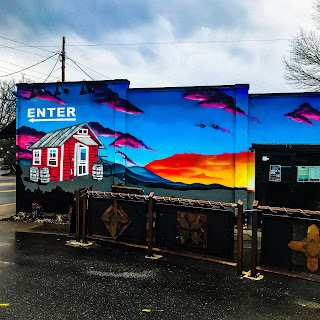 So anyway - parking for the brewery is out front on the side of the building or behind the building there’s much more parking in the lot. I’d also suggest just parking over on the side street ‘Covington’ and enjoying a nice stroll up. 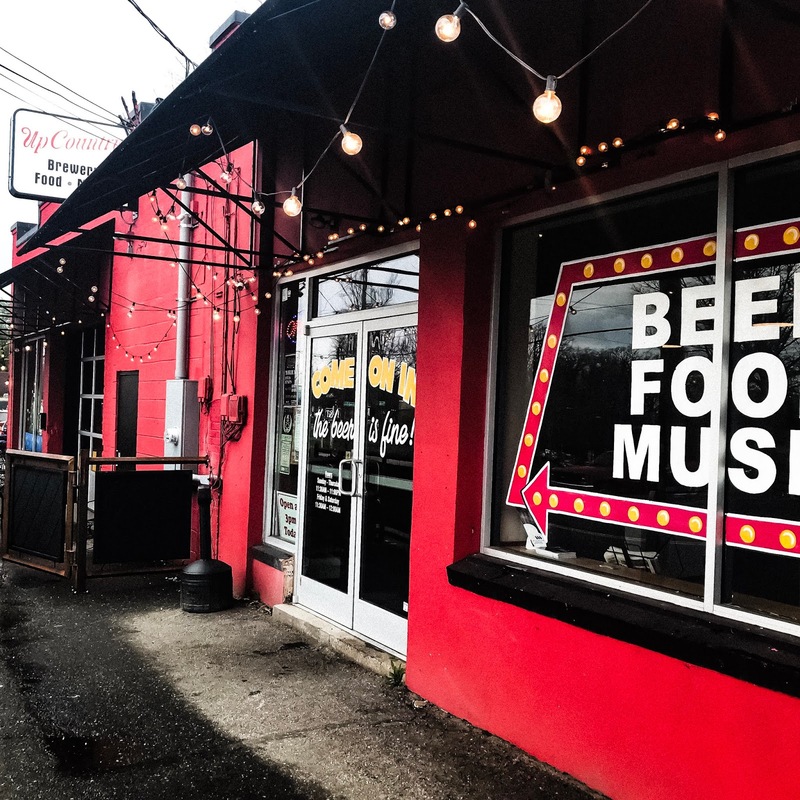 If you enter in the front door - just follow the signs to the taproom. Also; there is a large outdoor (pet friendly) patio. We decided to sit inside the evening we went since it was pretty rainy. 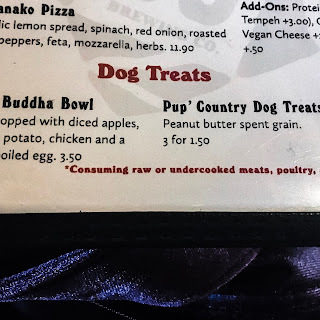 Oh - and if you do decide to bring the pups - they’ve got an omg special dog menu. Since UpCountry was full of Cat Weirdos; I felt right at home. 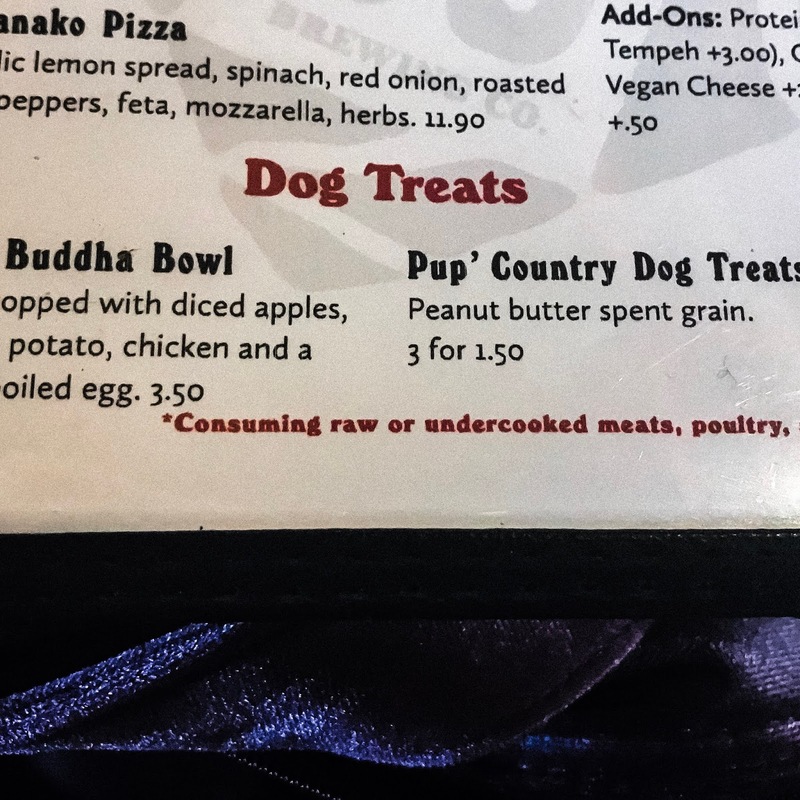 No one seemed to care that I was mumbling the meow mix jingle under my breath while looking over the menu and waiting for my friend to arrive. 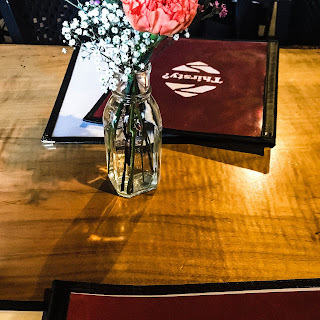 When my friend arrived, it was a nice surprise that we could still hear each other talk over the murmur of the community table, and didn’t have to resort to an strange game of pantomimed cues awkwardly resembling sherades. 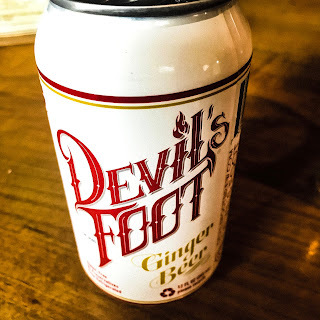 To drink; I had a can of Devils Foot ginger beer, which is brewed in Asheville. To my surprise - there was not (in fact) a shrunken crimson cloven hoove in the can; but rather a smooth ginger fizz with slight carbonation. 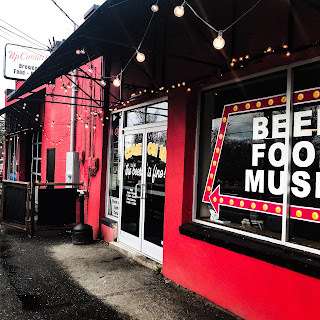 If you’re in the mood for a beer with some booze in it too - they have quite the extensive beer menu, as well. Shortly after ordering, my impossible burger came out in a fun lil basket. It was SO delish. (Not the basket - the burger). 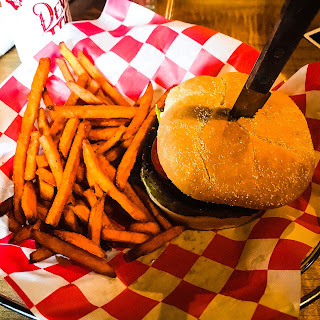 It really tasted like a real burger - my friend didn’t even realize I had been eating vegan until the bill came and she read “vegan” on the ticket. So the burger itself was very filling - it almost could have been two meals. For my side, I got sweet potato fries which were hot and fresh and had just the right amount of crunch to them! So not only do they have vegan burgers, my partner in crime for the night had vegan tacos, and I saw vegan nachos on the menu - as well. 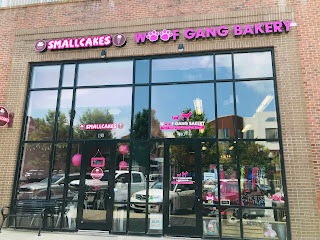 Plus; they’ve got a zillion other (non) vegan options too such as burgers, salads, pizza, etc. So; what are you waiting for? 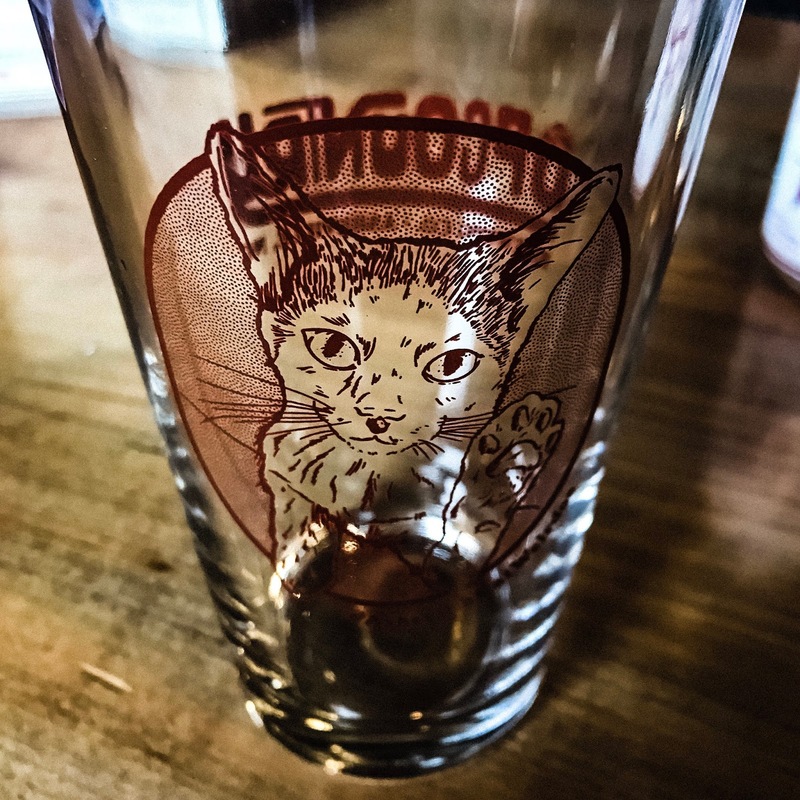 Get your bootie on over to Up Country this Thursday the 28th of March - for their last Asheville Cat Weirdos pint glass fundraiser of the season - and score an adorbs pint glass! Meet up with a friend, or go solo - sit at a community table & make some new friends!